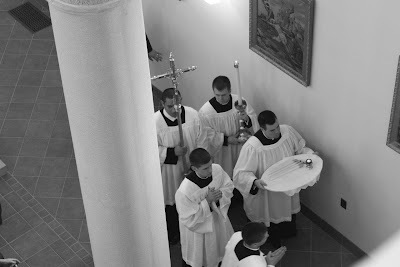 As promised, here are some more photos and some video of the Solemn Consecration of the new church of the FSSP at their seminary in Lincoln Nebraska, USA. 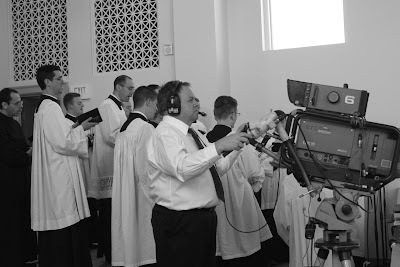 The whole ceremony as well as the Pontifical High Mass which followed, was captured and broadcast live by EWTN. 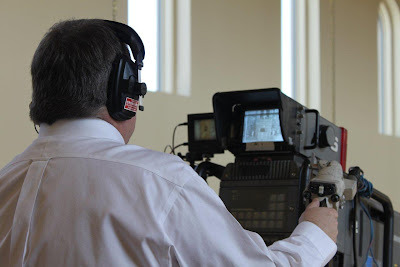 This video footage is available at the bottom of this post. 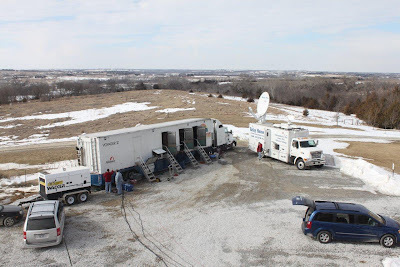 The EWTN film crew were set-up outside the new church. The view as the schola saw it. 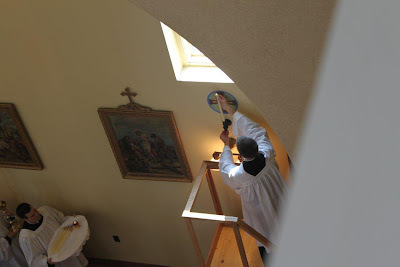 There were 12 crosses around the church, each of which had to be anointed by Bishop Fabian Bruskewitz, Bishop of Lincoln. There is a short video below. A candle was then placed on each one. Br. Magdala Maria, F.SS.R. was crucifer. 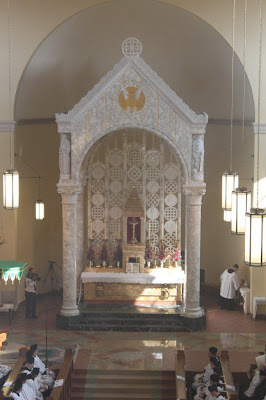 The altar just after it had been dressed. EWTN captured the entire ceremony. 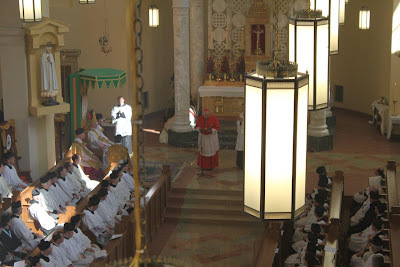 His Eminence William Cardinal Levada preached at the Mass. 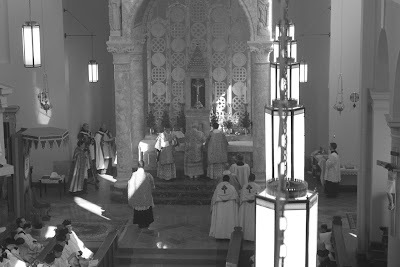 Bishop Bruskewitz celebrating Holy Mass. Fr. Ryan, F.S.S.P. 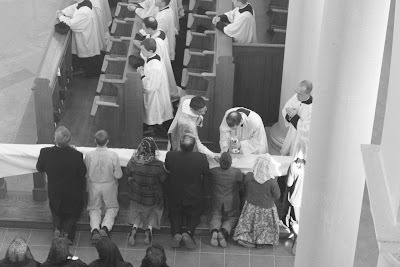 distributing Holy Communion. 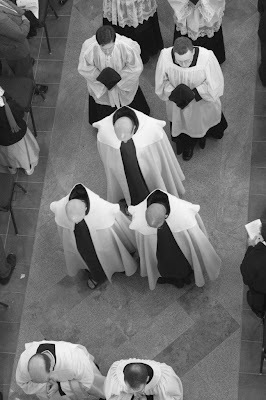 Some of the Carmelite Monks from Wyoming were also able to be present for the occasion. 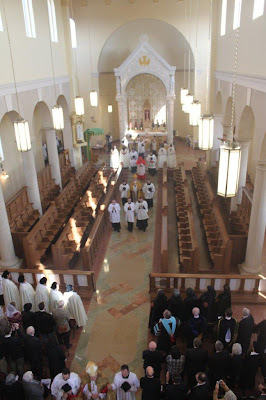 The procession out of the church after Mass. 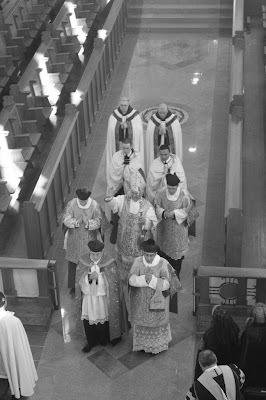 Two of the co-consecrating bishops can be seen as well as Cardinal Levada. Bishop Bruskewitz imparts his blessing. 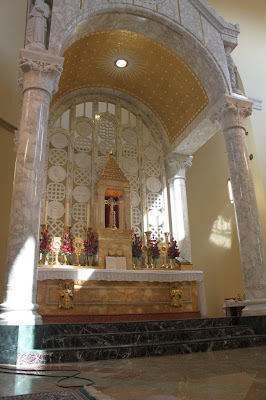 The high altar of the church of Saints Peter and Paul, Our Lady of Guadalupe seminary, Lincoln, Nebraska. There is a debate raging at Rorate over Cardinal Levada's homily. I've weighed in with a few comments of my own. Oh, wow, what a beautiful ceremony! It brings to mind the saying of Padre Pio that "It would be easier for the earth to exist without the sun than for man to exist without the Holy Sacrifice of the Mass"! May God bless you for all you do for His greater glory and the salvation of souls! 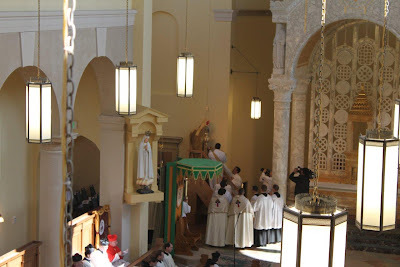 I was so pleased to learn of the participation of Transalpine Redemptorists and the Monks from the Carmelites of Wyoming at this Consecration. The traditional orders are slowly being allowed back. 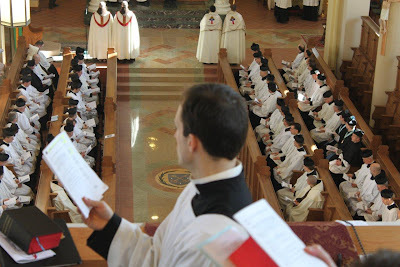 I yearn for the time when I can attend a EF Mass within a reasonable distance (75 miles). God Bless all who attended.